Maria Valverde attended the world premiere of ‘Exodus: Gods and Kings’ held at the Odeon Leicester Square on Wednesday (December 3) in London, England. 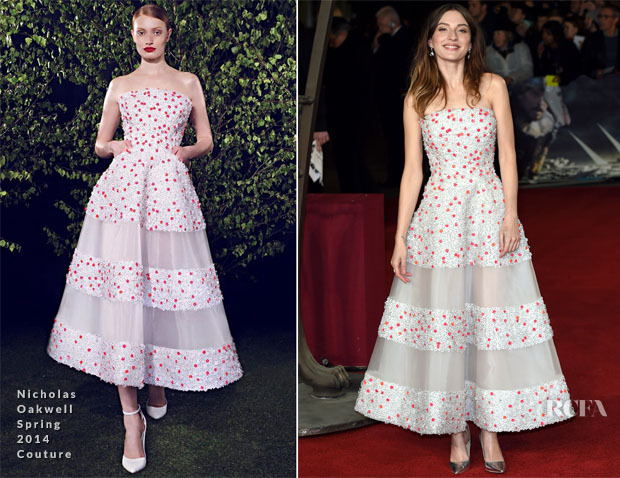 The actress wore a divine embellished white and rose appliqué strapless gown from Nicholas Oakwell’s Spring 2014 Couture collection. Her pretty, enchanting look with a fairytale feel was styled with metallic silver pumps and a pair of dazzling earrings. Some might be put off by the hairstyle, but I kinda like the non-fussy approach on this occasion. You may remember that Gillian Anderson wore this same dress in black and neon yellow earlier in the week. On that occasion some said they much preferred the look book picture, so does the look seem even better on the red carpet? Who Was Your Best Dressed At The Gotham Independent Film Awards?